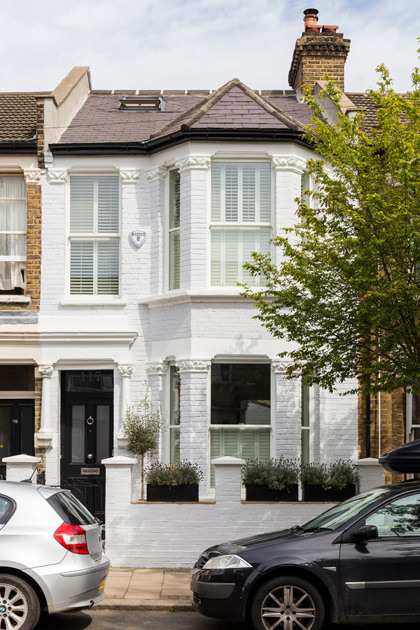 This picturesque Kilburn home refurbishment in NW6, London has been completed in 2015. We refurbished a two storey mid-terrace family house in North London. Longlisted for Don’t Move, Improve 2017 Awards. This terraced house in North West London – Queen’s Park / Kilburn area, did not have any work done for two generations. We had to cope with crumbling plaster and uneven internal walls. The house has been completely refurbished including the external facade of the building and the garden. The space has been maximised thank to changing the configuration of some of the rooms and by adding a rear extension. The loft has also been converted and a rear dormer installed. This added a brand new living level. Following a successful planning application, we added a side extension to contain an enlarged kitchen – dining room at the back of the house. Crittal door and panels have been installed to add a modern feel to this classic London property. Roof lights above the dining area introduce more light. We had to dug into the ground a little bit to add some essential space needed to install underfloor heating. During the works on the extension, we also put in a built in sound system for a seamless finish. The kitchen is made up of a single row of units, including some tall, pantry style cabinets, and a central island. The cabinets have a dark blue finish and a marble worktop. The house had still the traditional layout of the rooms with two separate reception rooms – one at the front of the property and one at the back. We removed the dividing wall and connected these two spaces. The front part remained as a living room, whereas the second part has been transformed into a play room for the young children. The focal point in the living room is the fireplace. A classic Chesney wood burner has been installed and a beautiful, marble fireplace surround mounted. Inside the wall recesses on both sides, plenty of storage space, with shelves and a cupboard, has been created. There is a low height toy storage and a children’s table inside the play room. The fireplace space has been cleaned and refurbished to add a decorative element to the room. The floor on the whole ground level has been replaced with reclaimed wood floor boards in herringbone pattern. Floor standing radiators of a classic shape has been installed in this section of the house. The first floor features now two single, good sized bedrooms, family bathroom and a large master bedroom. The master bedroom benefits from plenty of natural light thanks to a tall bay window. Some built in storage has been created to complement the owners’ antique furniture. The floor has been covered with natural carpet in a beige colour. The children’s bedrooms are of similar size. Both have the original wooden flooring, which has been sanded down and painted white. The bigger room of the two has a feature wall with green pattern wallpaper, whereas the second nursery has neutral grey colours. This family level of the house has one medium sized bathroom containing both a bath and a shower. Traditional style taps and sanitary-ware have been paired with more modern geometric floor tiles. A new living level has been gained by converting the loft space. A full width rear dormer extension provided additional height. The new floor now houses a large guest suite with a shower room. The tricky spaces under the eaves have been turned into bespoke storage. A new wooden staircase has been built to give access to the top level. Throughout the house, several original features have been preserved. This included a missing piece in the front reception room cornice, which according to the previous owners fell down during the Blitz attack during the WW2. All windows were replaced with double glazed sash windows. Traditional windows shutters have been installed on the inside. On the outside, the pre-existing pebble dash front façade was taken back to the brick, restored and painted. These works helped to restore the character of this building. The regeneration works continued throughout the outside space. The style of the rear garden is a mix between a low maintenance city garden and planted space. The majority of the surface has been tiled with large stone tiles, however plant beds have also been created to add some natural greenery.